As we reached the end of the road, the stone wall stood between us and our quest: the Greek ruins of Paestum, Italy. Beyond the wall was a massive temple that looked like it had been transported out of ancient Greece. Our excitement began to grow. We’d traveled a long way for this. The Paestum ruins did not disappoint. 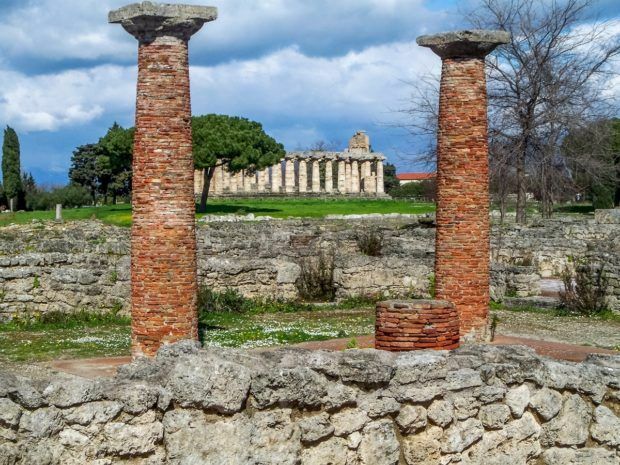 Why did we decide to visit Paestum? Why not? The real answer is that we always try to pack just a little (or a lot) more into a trip. After several days on the Amalfi coast, we needed to do more. In retrospect, that wasn’t a good idea. However, the Greco-Roman ruins of Paestum seemed to fit the bill. If we realized how challenging this was via public transportation, we probably would have skipped it. But we soldiered on…and had a remarkable experience. We don’t know why the idea of Greek ruins in Italy surprised us, but they did. The Paestum ruins are comprised of three major Greco-Roman temples and a number of smaller ruins. Some of the ancient Greek temples at Paestum pre-date the Acropolis in Athens, Greece by several hundred years. Most are from the Doric period: 600-400 BC. They are ancient. And they are remarkably well preserved. 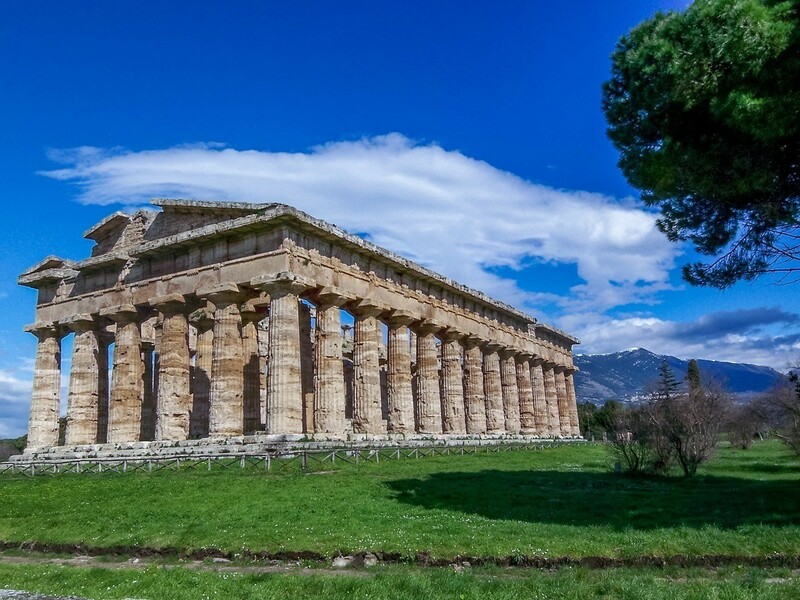 The entire Paestum Archeological Site is a UNESCO World Heritage Site. In the heart of the town, we explored the dual Temples of Hera. The open-air Temple of Hera I dating from 550 BC, and the Temple of Hera II dating from about 100 years later. Both are perfect examples of the Greek temple plan with broad Doric Columns. The second Temple of Hera is remarkably well preserved and looks incredibly pristine. A short distance away is the old Temple of Athena, also an ancient Greek temple dating from around 500 BC. 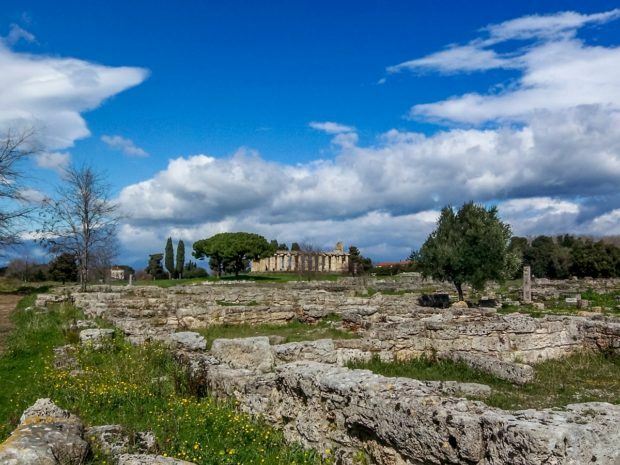 Paestum is one of those sites that you will never forget! We were totally blessed to have the site nearly to ourselves. A couple of German tourists, who were kind enough to take our picture, were the only other souls to be seen. After two and half hours walking around the ruins, we were awe struck. 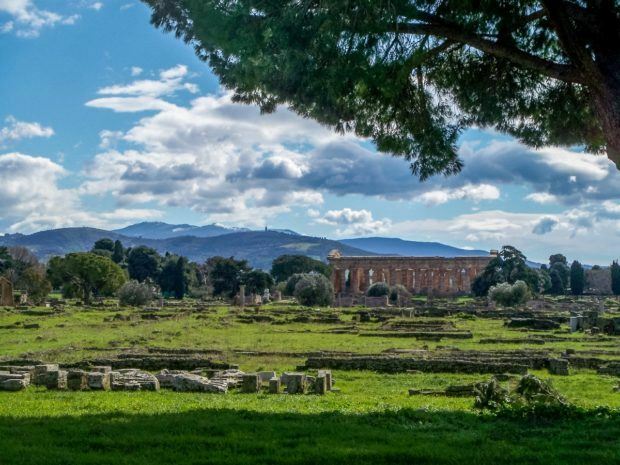 The Paestum ruins are one of the most impressive world heritage sites you’ve probably never heard of. They are certainly the most impressive ancient ruins in Italy that we’ve ever had the chance to visit. However, anyone finding themselves south of Naples really needs to make the effort to visit Paestum. We’ll be honest, it’s a challenge. From Sorrento or the Amalfi Coast, get to Salerno. The train from Salerno to Paestum runs infrequently (usually just a couple of times a day). The bus runs more frequently from the and will drop you off on the side of the road about a quarter mile from the Paestum ruins. Walk the rest of the way (head west – the area is not well marked). If you manage to catch the train, you’ll do the same walk (head west), but it’s about a half mile walk. When the road dead ends, make a right to the small village, which is the entrance to the site of the Greek city of Paestum. Take the train to the Paestum stop. The station is one of those unmanned ones. There is no baggage check. Walk west until you hit the archaeological site. Make a right when the road dead-ends and walk to the small village. There are pricey, private full day and half day tours from most of the major cities in the vicinity, including Amalfi and Naples. 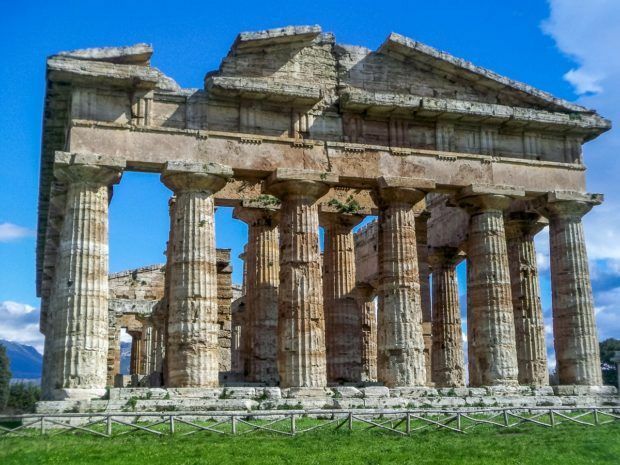 For those looking for a more economical option, there is a full-day tour from Sorrento to Paestum that takes in both Salerno and Paestum. There is no baggage check facilities at the train station or in town. If you have bags, your best bet is to hit up one of the two cafes in town and try to swing a deal. 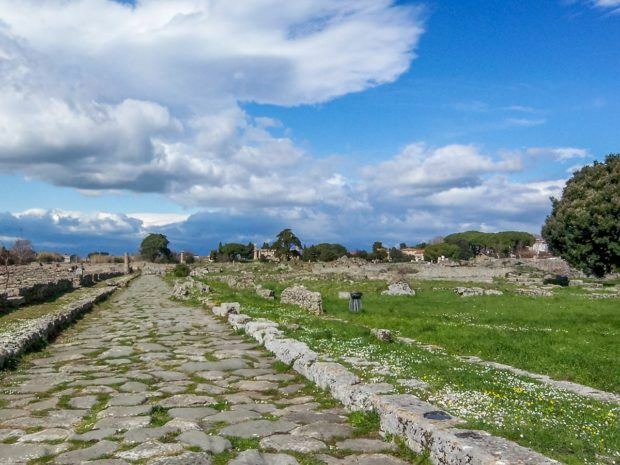 Better yet, leave the baggage at a hotel and make your visit to Paestum as a day trip. There aren’t a lot of options here (even less in the off season). We ate at the La Basilica Café di Voza Marco (it’s the one right across from the tourist information office). The pizza is decent and the service is zippy quick (by Italian standards). 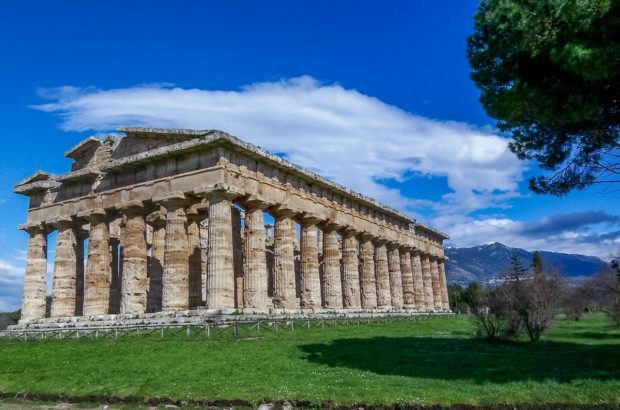 What do you think about The Ruins of the Paestum Temples? Paestum is really really nice.i been there once and i defenitly wanna go there again.